The following are detailed instructions on how to download and run the Natalog software. Step 1. On Natalog's homepage click the Run button. If you instead get a web page with strange text, a web page stating that the page could not be loaded, or a window asking you to save a file, then you probably do not have Java installed. You should download and install Java and click the Run Natalog button again. Java is free and trusted software, and Natalog cannot run if Java is not installed. The download time of Natalog will range from a few seconds with a high-speed Internet connection to several minutes with a dial-up connection. Step 2. Grant permission to run the software. Once the download is complete, your computer will verify with you that you want to run the software. Answer "Run" to this window to allow your computer to run the software. If you would like to avoid this question in the future, check "Always trust content from this publisher." If you get the message "Application Blocked by Security Settings," you'll need to override your Java settings to run Natalog. On Mac, you can Control-click the downloaded .jnlp file. 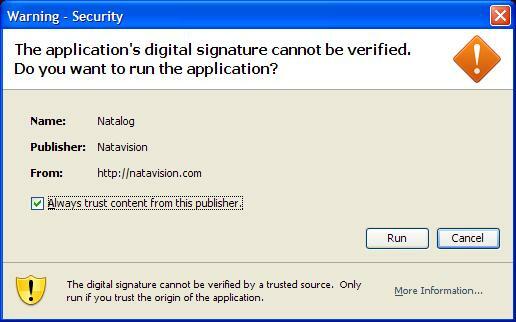 On Windows, add "http://natavision.com" to the Exception Site List in the Java Control Panel and re-run Natalog. Visit the troubleshooting page for more details. Your computer will automatically put an icon on your desktop and a menu item on your Start Menu. You can use these shortcuts to start Natalog in the future. Step 3. Log in and start using Natalog. When Natalog's window appears, you are ready to use Natalog! Enter your username and password on the Sign In screen and click Sign In. If you do not have a username and password yet, you may get a subscription on Natalog's homepage. PayPal™ will assign you a username and password, which you can use to sign into Natalog. Once signed into Natalog, you may change your username and password if desired.